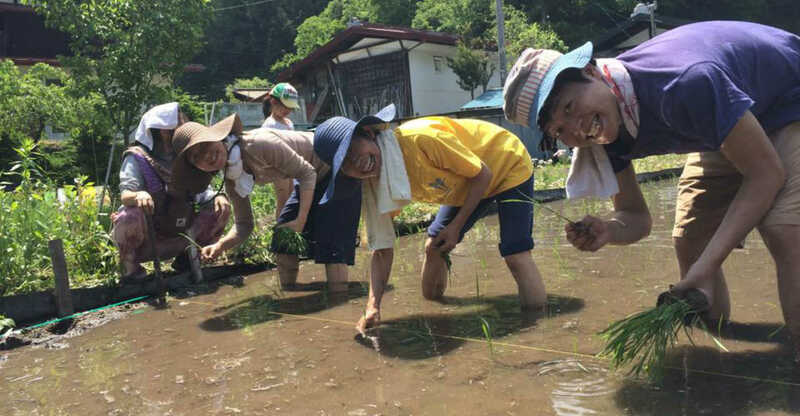 I thank the many volunteers who wish to help at Organic Farm 88! We welcome volunteers from all over the world who want to help farm and enjoy life in the countryside. We enjoy talking with volunteers who have a variety of backgrounds. Since Organic Farm 88 is located in the countryside, most of our volunteers have lived in our house together with us. This means that consequently we share not only work on the farm, but also our daily lives. Thus, we made a few rules so that we can enjoy our lives together at Organic Farm 88. If you wish to join us, and if you can agree with our policies, please contact us. Thank you. We welcome volunteers from April to November. We try to welcome volunteers as a part of our family, so we don’t think of volunteers as free labor. We want to work together with a good feeling while we give care to our vegetables. Our vegetables are raised with great care from our many volunteers. We provide your farming tasks depending on your experience. There is a variety of work that goes into the process of making our unique organic vegetables. The main work is, of course, farming, but we also ask you to make a fire for the bath, cook, and do other things related to living on our farm. We hope your experience here is fruitful and can provide some tips for living. Also, we want to learn something from you. We hope that we can share time together, which is filled with inspiration and joy. It would be our pleasure if you could enjoy tasting our fresh vegetables, see the beauty of nature that surrounds us, and also enjoy the time spent at our home. ・ Adult men only. This is because the work in Organic Farm 88 sometimes requires physical labor. ・ We welcome female volunteers only when they were together with boyfriends or husbands. We welcome the volunteers who can match the conditions above. * Please check out the articles on our web site. You can read the Introduction, Farm　Diary, and WWOOFer's Diary. We hope you can share the feeling of what we think is important. * If you have something you are good at, please let us know. If you stay here longer, you will get a day off every 6 days. The time to start the day, and the kind of work differs from season to season. We have breakfast together at 7 a.m. Basically, we work for 6 hours each day. We take a couple of breaks within that time. We usually have dinner at 5:30 or 6. Since we wake up early in the morning, we start to relax in the early evening. We may ask you to share a room with other volunteers if we have many volunteers at one time. We provide Japanese bedding, which includes a futon (to lay out on the floor), sheets, blankets, and comforters. We ask volunteers to take turns cooking lunch for everyone. Usually, Yoko (one of the hosts) cooks breakfast and dinner, but we may ask you to help cook when we have many volunteers. At harvest time, we often cook meals with our fresh organic vegetables. We eat mostly vegetables, and not so much meat. We often welcome vegetarian or vegan volunteers. We don't use any chemical seasonings, but we do use healthy traditionally-made seasonings. We make miso, soy sauce, and pickled plums, which are traditional Japanese seasonings and foods, along with different kinds of dressings and other sauces. We like to enjoy each meal after working. Please pay attention to some of the house guidelines. ・ Please don’t use synthetic detergents. ・ If you want to bring and use your own shampoo or soap, please buy environmentally friendly soaps or shampoos. You can also use our soap to wash your body and hair while taking a bath if you want. ・ Please use the environmentally friendly detergent that we have at the house. We live together with young kids. Please pay attention to the issues listed below. ・ Please enjoy spending time with our kids as long as it doesn’t take away energy you will need for farming. ・ Please don’t bring any cigarettes, cigars or any illegal drugs. ・ Please educate the kids if they are doing something that you feel is inappropriate. ・ We don’t have TV. Please feel free enjoy to our recreational equipment or have conversations with other volunteers and us. ・ Please don’t play any video games, or use tablets such as Nintendo or the iPhone in front of the kids. ・ Please don’t give our children snacks or drinks from the supermarket or eat them in front of the kids. ・ Please don’t listen to recorded music while the kids are at home. Playing instruments during the day is very welcome. Please bring clothes that can get dirty or damaged, and bring shoes for farming such as hiking boots and rubber boots. Also, bring a rain jacket, hat, water bottle, and long-sleeve shirts and pants even during the summer. 4. Your way of transport to Organic Farm 88. For example, will you take the bus, train or car? 5. How did you hear about Organic Farm 88? We would like to accept everyone, but for some reasons, we may not be able to accept your volunteer request at certain times. Copyright ORGANIC FARM 88. All Rights Rserved.